Marines of Delta Company, 1st Recruit Training Battalion, run in formation during their motivation run at Marine Corps Recruit Depot San Diego, August 6, 2015. After these Marines complete the run, they will spend the rest of their afternoon with their families, friends and loved ones during on-base liberty. Today, all males recruited from west of the Mississippi River are trained at MCRD San Diego. The depot is responsible for training more than 16,000 recruits annually. Boot camp graduations are usually on Fridays. Sometimes, due to holidays such as Thanksgiving, Christmas, and the Marine Corps Birthday, graduation will be on a Wednesday. If that is the case the USMC schedule will indicate the alternate family day and graduation dates. Parris Island and San Diego DO NOT necessarily follow the same schedules when there are changes. Graduation and ship dates are kept up-to-date on this page. We encourage you to join your recruit's graduation group on Facebook. It will be a great place for you to connect with other families who have recruits going through boot camp with your son or daughter. Click on the link beside your recruit's graduation date to request to join that group. Looking for boot camp groups by graduation dates? We have a place to connect and share with other family members who have a recruit in Marine Corps boot camp. See the links below for Official Recruit Parents Facebook graduation groups. Have a Poolee that has not gone to boot camp yet? 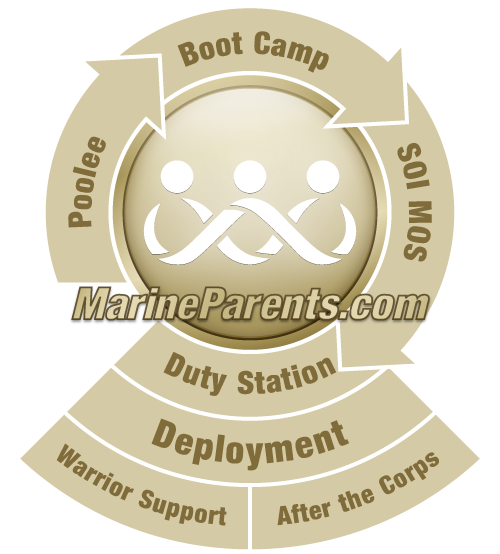 Join the Official MarineParents.com Poolee Group. Para los familiares de habla hispana clic Recruit Parents en Español. Click here for Girlfriends, Fiancees, & Wives of Recruits/Marines. 2019 Parris Island graduation dates beyond July 19, 2019 will be confirmed and added to this page as soon as the Marine Corps publishes those dates.